Meet the new teacher. For kids, one of the biggest back-to-school fears is their new teacher. Take advantage of your school’s open house or back-to-school night. Some teachers welcome phone calls or e-mails — take advantage of the opportunity. If your child’s teacher sends a welcome letter, be sure to read the letter together. Tour the school. Open house is a great way to get your child familiar with the new areas they will be using on a daily basis. Together you can meet their teacher, find their desk, or explore the playground. Connect with friends. A familiar friend can make all the difference when heading back to school. 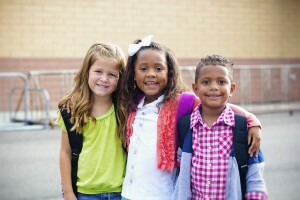 Refresh these relationships before school starts by scheduling a play date or a school carpool. Tool up. While keeping the class supply list in mind, allow for a couple of splurges like a cool notebook or a favorite-colored pen. These simple pleasures make going back to school a lot more fun. Ease into the routine. Avoid first day of school mayhem by practicing your routine a few days in advance. Routines help children feel comfortable and establishing a solid school routine will make the first day of school go much smoother. If you would like to learn more about back-to-school preparations, contact Simple Acts of Care and Kindness at 866-459-7225 or visit www.simpleacts.org for additional information.